This one confused me for a long time, so I figured I should write this down before I forgot again. Let be an abstract smooth manifold. We want to define the notion of a tangent vector to at a point . With that, we can define the tangent space , which will just be the (real) vector space of tangent vectors at . Geometrically, we know what this should look like for our usual examples. For example, if is a circle embedded in , then the tangent vector at a point should just look like a vector running off tangent to the circle. 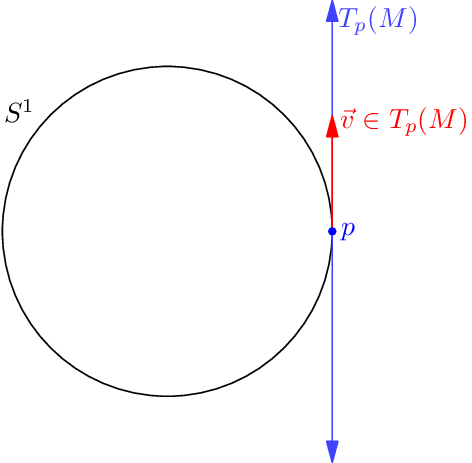 Similarly, given a sphere , the tangent space at a point along the sphere would look like plane tangent to at . However, the point of an abstract manifold is that we want to see the manifold as an intrinsic object, in its own right, rather than as embedded in . This can be thought of as analogous to the way that we think of a group as an abstract object in its own right, even though Cayley’s Theorem tells us that any group is a subgroup of the permutation group. (This wasn’t always the case! During the 19th century, a group was literally defined as a subset of or of . In fact Sylow developed his theorems without the word “group” Only much later did the abstract definition of a group was given, an abstract set which was independent of any embedding into , and an object in its own right.) So, we would like our notion of a tangent vector to not refer to an ambient space, but only to intrinsic properties of the manifold in question. So how do we capture the notion of the tangent to a manifold referring just to the manifold itself? Well, the smooth structure of the manifold lets us speak of smooth functions . In the embedded case, we can thus think of taking a directional derivative along (i.e. some partial derivative). To give a concrete example, suppose we have a smooth function and a point . By the structure of a manifold, near the point , looks like a function on some neighborhood of the origin in So we are allowed to take the partial derivative of with respect to any of the vectors in . For a fixed this partial derivative is a linear map . It turns out this goes the other way: if you know what does to every smooth function, then you can figure out which vector it’s taking the partial derivative of. This is the trick we use in order to create the tangent space. Rather than trying to specify a vector directly (which we can’t do because we don’t have an ambient space), we instead look at arbitrary derivative-like functions, and associate them with a vector. More formally, we have the following. A tangent vector is just a derivation at , and the tangent space is simply the set of all these tangent vectors. , where is the constant function on . whenever . Intuitively, this means that if a function vanishes to second order at , then its derivative along should be zero. In other words, the tangent space is actually the dual space of ; for this reason, the space is defined as the cotangent space (the dual of the tangent space). This definition is even more abstract than the one with derivations above, but it has the advantage (or so I’m told) that it can be transferred to other settings (like algebraic varieties). It is defined only in terms of the ring of “regular functions” defined on the space. The former is nice for philosophical reasons. The latter is nice because we can pull in a lot of intuition about manifolds into the study of algebraic varieties, and similarly, we can inject a lot of ring theory into the study of manifolds. In other words is the set of functions which vanish at and such that all first derivatives of vanish at zero. and so the cotangent space, hence tangent space, indeed has dimension . The definition of m^2 should be the abelian group spanned by the products fg. Yep, thanks for catching that. I recently watched a series of YouTube videos by Leonard Susskind on general relativity. In lecture one he said that we were just going to take it for granted that our coordinate systems were such that we could do all of the things we needed to do – take derivatives, etc. etc. Now I see why. A couple of days ago I waded into all of this for one reason: I wanted to achieve the same sort of intuition about cotangent spaces that I had about tangent spaces. I must have looked at 50 different documents online, and from what I can tell there is a veritable Mt. Everest of tedious work involved in carefully building all this stuff up, all just to be able to do something like take the partial derivative of something. I absolutely see why Susskind didn’t want to fret with it – he wanted to get down to the business at hand. Yep. Thanks, I will fix this.